Bachman Subaru General Manager Jeff Harmon presents the 2017 Share the Love Event donation to SOKY President Trish Mazzoni and Board Member Rusty Skaggs at the State Basketball Tournament. For the sixth consecutive year, Bachman Subaru in Louisville is giving you a chance to support SOKY with a new Subaru purchase as part of the nationwide Subaru Share the Love Event. Everyone who purchases a new Subaru from Bachman between Nov. 15 and Jan. 2 will have the opportunity to designate $250 of their purchase to go to Special Olympics Kentucky as part of the program. The Share the Love Event includes five national charities, but Subaru gives individual dealers the opportunity to include a local organization in the promotion as well. Bachman General Manager of Sales Jeff Harmon — the father of Special Olympics Kentucky athlete Justin — opted to include Special Olympics Kentucky. To generate a donation, buy your new Subaru at Bachman Auto Group (9800 Bluegrass Parkway, Louisville) between Nov. 15 and Jan. 2 and tell your salesperson that you would like to designate your Share the Love donation to Special Olympics Kentucky. 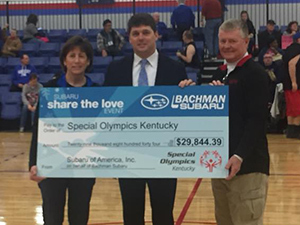 Last year, Bachman Subaru raised $29,844.39 for Special Olympics Kentucky during the Share the Love Event. They presented their check to Special Olympics Kentucky during the 2018 State Basketball Tournament. Bachman Subaru donations now top $120,000 over the five years they have included us in the promotion. We are excited and thankful that they have decided to include us in the Share the Love Event again this year. For more information about SOKY’s participation in the Bachman Subaru Share the Love Event, contact Special Olympics Kentucky President and CEO Trish Mazzoni at 502-695-8222 or tmazzoni@soky.org; or Jeff Harmon at 866-254-5003.